My full notes and analysis on the Wall Street Journal from the past week: January 17-22, 2017 (Week 3). Please Enjoy. Translation: AIG paid a high price and Buffett got a bargain. China’s economy achieved yet another year of “stable” GDP growth, but their growth comes at the expense of increasing disorder everywhere else in their economy. This type of behavior is known as an “autocatalytic reaction.”, which is a mental model that I now use to think about China’s economy. China creates GDP Stability at the expense of Economic Chaos everywhere else. Below are examples of China’s autocatalytic economy in action. These “dai chi” agreements are outrageous…Used to temporarily move funds around in order to skirt government audits, as well as take on more risk. Doesn’t this sound familiar to AIG and credit default swaps? Chinese investors are grasping for any investments to get their money out of China or the Yuan. As a result, they are creating volatile and unusual behavior in Copper prices, among other asset classes. “In five hours on one day, we say (copper) prices trade in a range that would normally take a year” to play out. 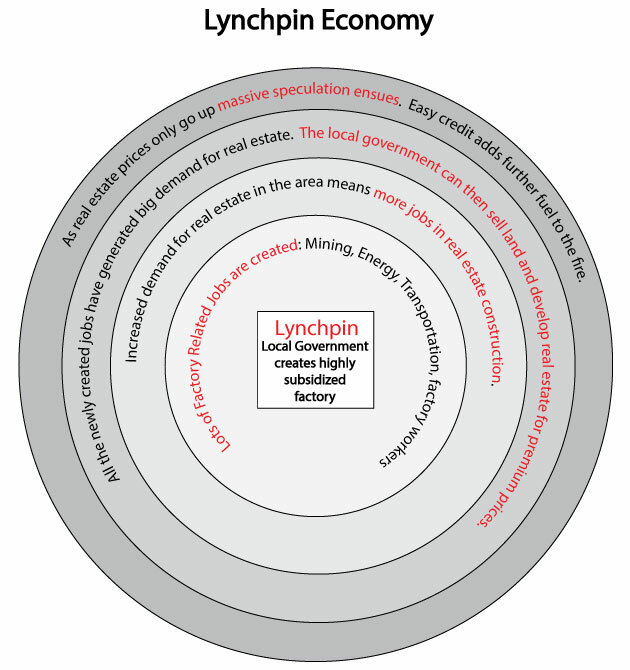 If Trump stops China from dumping highly subsided products into our markets (link), I think he’ll unintentionally destroy the lynch-pin holding together China’s economy…highly subsidized factories. China’s local governments fund themselves by land sales and real estate development. But the land is only valuable if there are people and jobs. The easiest way to create jobs is to subsidize industries which can generate LOTS of jobs, like steel production. Steel production creates jobs in mining, transportation, energy, engineering, and of course factory workers. With lots of people working, or soon to be working, demand for real estate skyrockets. This in turn creates more jobs because workers are needed to build all this new real estate. It might be ok if only a few cities in China used this model, but I believe this to be pervasive. As a result, China is creating WAY too much steel and other products. With an oversupply of subsidized goods, they must dump them into U.S., and global markets for whatever prices they can get. If the Trump administration stops China from dumping its highly subsidized products into the U.S., subsidized factories all over China will quickly implode and take entire cities with it. Being so highly leveraged, China is not in a position to handle the impact of such an event. This of course is just my hypothesis, and I welcome any disconfirming evidence. It feels like we’ve entered a new area that I’d like to call “retail meritocracy”. Brand names use to serve an important role in signaling both value and quality to consumers. But with easy access to internet reviews and scores, brand name goodwill seems to be rapidly deteriorating for many companies. Luxottica appears to be a good example. Luxottica has a dominant position in the old world distribution and marketing platform of sunglasses and eyewear. In this old model, floor space and brand names served as a solid barrier to entry. But there’s been a trend towards commoditization of sunglasses and eyewear as consumers become more comfortable with buying off-brand names like Warby Parker. Online reviews, ratings, etc. have weakened Luxottica’s competitive moat. In another example of “retail meritocracy”, Kirkland brand golf balls became a hot selling items when it was discovered that they perform nearly as good as Titleist Pro VI golf balls. “This is just a perception killer,” The Kirkland golf balls retailed for $1.25/ball, while Pro VI’s retailed for ~$4/ball. We have entered a time of retail meritocracy where many brand-name-moats are being eroded more quickly than anticipated. A likely example of lying with statistics. The DOJ found that private prisons were more dangerous than government-run facilities. Note: Nowhere in his comment does this frequent Amtrak traveler consider the $120 billion cost. When the Fed and U.S. Government talk about the success of their economic programs they largely speak of 1) an increase in overall demand and 2) a reduction in unemployment. When they say the economy is “healed”, they are likely measuring it by overall demand and unemployment numbers. Oops! When Little Errors = Big Mistakes. Two examples of little mistakes that lead to big errors. In 2015, the reported number was 347 colleges. Today it stands at 1,029. The U.S. military was paying 30,000 Afghan soldiers that didn’t exist! That came out to $13 million per month. Now, the U.S. military will only pay Afghan soldiers who were biometrically enrolled in the nation’s army. I’m Curious. Is this an Accounting Illusion, Real, or Both? I’m curious about this case. I wonder if Mr. Harrison’s operating efficiencies are real or are merely accounting related. After all, he’s able to do what no one else in the industry is capable of doing, which should raise some questions. On the backs of the second longest bull-market in history, artificially low interest rates have created intense competition among investors for any yield whatsoever. Furthermore, ultra-low interest rates have incentivized land-lords not to sell, which has reduced supply and intensified competition further. Plano Texas’s raw land has gone from $8 to $10 a square foot a few years ago to $60 today. Due to growing appeal to corporate tenants. Ultimately it was won by the investor able to secure a high loan to equity ratio. “It’s unusual for an investor group to be able to borrow such a high percentage of a deal’s value, as Mr. Ware’s group did. Participants said it worked because the bank will get an equity like return if the group hits the “jackpot” with the new leasing and land development. Hunt for returns in an Ultra low interest rate environment: “The record level of dry powder comes as investors increasingly have turned to commercial real estate in a hunt for returns. Ultra low interest rates at global central banks have made returns on offices and shopping malls look attractive compared with other asset classes such as bonds. “batteries are getting cheaper at 4% to 8% a year, and that compounding over the last five years has had a massive impact” on the electronic-vehicle industry. Meanwhile, increasing demand has had an inflationary effect on price of oil and gas service providers (link). There’s been a big shift in the FHA lending market for single-family mortgage market over the past 10 years. “It’s too costly to originate”: “J.P. Morgan Chase & Co., the nation’s largest bank by assets, isn’t among the 50 largest FHA lenders. In 2013, it was the third largest,”…”It simply is too costly and too risky to originate these kinds of mortgages,” Jamie Diamon wrote. FHA share of the mortgage market has tripled: “the FHA share of the overall mortgage market is larger than during the last housing boom. In the years leading up to the housing bust, FHA loans accounted for less than 5% of annual mortgage volume. Since the meltdown, the share has ranged from 11% to 15% of originations. The Trump administration seems likely to curb large housing affordability programs which make mortgages more accessible to lower income families, but at the same time distort free market dynamics. This would likely put downward pressure on home prices. There’s a lot of certainty and confidence going on. Investors are feeling much more confident, the fed is feeling much more confident, consumers are feeling much more confident, etc. But should we trust them? Caution would be the prudent advice. The article, “Don’t Let Others Sway You When Making Investment Decisions” (link), points out that we can be heavily influenced by people with an intense belief in ignorant views. “In a paper published in 2000, Prof. Shiller showed that confidence varies, often going up after the market rises and falling after it goes down. The confidence of individual investors rose 4% in July 2008, for instance, right before the market got sucked into the black hole of the financial crisis. Janet Yellen is viewing things positively. During a dramatic drop in oil prices, oil & gas companies get a sort of mini-bailout by their service providers. These service providers effectively absorb some of the losses from oil & gas companies, thereby shielding them and making the decline more manageable. But the effect is a two-way street. When oil price rebound, service providers are quick to raise prices and dampen the benefits of rising prices. The service providers have high fixed costs. Upon declining oil prices, oil & gas companies cut demand for their services. Because service providers have high fixed costs, they will continue to provide services at a loss, sometimes just as long as their variable costs are covered. I believe you could say that, to some extent, the fixed costs of your service providers or suppliers act as a shield in bad times. They will/must lower their service fees, thereby making the hard times more tolerable. 1) We should look at service providers and suppliers and determine the level of their fixed costs and variable costs. 2) Oil & Gas companies should really position themselves better to take advantage of a decline in oil prices. Before the decline in oil & gas prices, the whole industry had positioned themselves aggressively. When the crash came, no company was in a position to exploit the lower costs offered by service providers. Or buy oil assets at discounted prices. Instead, they all waited for a rebound in prices to start working again, at which point, they completely missed out on compelling market opportunities. I’ve been having a serious case of “financial headline” déjà vu. Over the past month I’ve been seeing the phrase, “the worst…since 2008”, repeated over and over throughout various economic and financial articles. The repetitive nature of this ominous headline seemed glaring. But was it really as pervasive as I thought? Or was I just seeing something that wasn’t there? Fueled by this “Neo”-like curiosity, I decided to look into it further. I searched for any article from the past month that said, “worst” + “since 2008”, “since the Great Recession”, “since the financial crisis”. This search yielded rich results of news articles which confirmed my observations. Without much surprise, these articles painted a gloomy picture of the global economy, reminiscent of 2008. Despite the one-sided nature of this search, it’s generally “not good” to draw strong parallels with the Great Recession. If the global economy continues down this path, we could end up experiencing an economic déjà vu. Only this time we may be faced with the truth of reality as we come to realize that “Blue Pills” are suddenly hard to find. The articles below summarize some fascinating insights into various economic struggles around the world. The benchmark Shanghai Composite index tanked more than 24 percent last month while the Shenzhen Composite tumbled 27 percent, taking the title of Asia’s worst-performing indices in what has been a tumultuous start to the year. For the week, the Nikkei dived 11.1 percent, the biggest weekly drop since October, 2008. Standard & Poor’s has eight Indonesian companies on negative outlook or on review with negative implications, the highest level since 2009. Japan’s annual exports in January fell the most since the global financial crisis as demand weakened in China and other major markets…Exports fell 12.9% year on year in January in their fourth straight month of declines…led by a slump in shipments of steel and oil products. On quarterly basis, GDP, however contracted by 1.83%, again a bit better than 1.93% expected contraction. Economists expect, Indonesian GDP growth to stick around 4.5% in first half of 2016 due to slowdown in China. Foreign institutional in vestors (FIIs) have net sold equities to the tu ne of nearly Rs 10,700 crore so far in January , making it he worst start to a New Year (worst January) since 2008 when the global financial crisis roiled the markets across the world. The island nation’s gross domestic product expanded 0.85 per cent in 2015, the slowest rate since 2009. Meanwhile, GDP dipped 0.28 per cent in the final three months of 2015 — the second-straight month of contraction. Exports have sustained a double-digit drop for eight consecutive months, the Worst since the 2008-2009 financial crisis Yeh said Tuesday, adding that exports in the first three months of the year could all be negative. If this is the case, Taiwan will experience again the longest decline in exports of 14 consecutive months, which occurred during the financial storm, Yeh said. Ominously, ANZ note that the last time sentiment fell in January was in 2008, right before the onset of the global financial crisis. Eleven U.S. high-yield bond defaults have occurred this month, according to Fitch- the highest one-month count since September 2009. Government-worker retirement plans had 0.36% return last year…the smallest advance since 2008. State and local pensions count on annual gains of 7 percent to 8 percent to pay retirement benefits for teachers, police officers and other civil employees. When pensions don’t meet their targets, governments have to put more taxpayer money into the funds to make up the difference. The need to do so has led to credit-rating cuts for New Jersey, Chicago and Illinois, which are being squeezed by rising retirement bills. Hedge fund performance since the start of the year has been the worst since 2008, according to new data from Hedge Fund Research. Personal consumption, which accounts for more than two-thirds of U.S. GDP…according to the fourth quarter estimate…was the Worst year-end showing, year over year, since just after the 2008-09 recession ended. The Current Situation Index had hit an all-time high of 103.8 last July, at a time when the restaurant industry, while keeping a worried eye on the market turmoil and the slowdown, was still optimistic that restaurants were independent from it all, that Millennials would pull through, and that consumers in general were still hanging in there. Since then, the Current Situation Index has plummeted 4.2%, on par with the worst 5-month plunge during the Financial Crisis. Back then, the index started out at a lower point, from 102 in early 2007, dropped for two entire years, in all 6.3%, to hit 95.7 in early 2009, before edging back up. So this is not a good sign. These kinds of plunges only occur when something big is going on. Fears over a sell-off in the European banking sector have gathered pace after the Stoxx Europe 600 Banks Index, the gauge of the banking sector in Europe, recorded its sixth consecutive weekly decline, the worst streak since 2008. Europe’s earnings season is only half-way through, but so far even stable profit generators are showing signs of capitulation. The gap – up one percentage point on the previous year – was the widest since 1991 and showed a particularly marked deterioration since the onset of the financial crisis and deep recession of 2007-09….Productivity among all the G7 countries deteriorated since the so-called great recession, but the ONS said Britain had been hit hardest. Alberta’s job losses last year were 19,600…those losses exceed the 17,000 jobs Alberta shed in the Great Recession in 2009. It’s the worst year since, 1982, when the province lost more than 45,000 jobs, amid the double-whammy of a global recession and the notorious NEP, a federal government program that capped prices, raised taxes and dramatically discouraged investment in the oil patch. It’s been 13 months since Target Canada filed for bankruptcy protection in an Ontario court on Jan. 15, 2015, capping one of the most disastrous expansions in the history of the retail business.